The Greater White-fronted Goose is a springtime visitor to Idaho. It is occasionally seen in Eastern Idaho so check out flocks of Canada Geese and Snow Geese for this bird. Whoever named the Greater White-fronted Goose as such was accurate but lacking in creativity. It is easy to accept the scientific name, Anser albifrons , where albifrons literally means white front, as that is what scientific names are for. The common name of Greater White-fronted Goose is too utilitarian, a naming tactic too often used in the bird world. The Greater White-fronted Goose is a medium-sized goose, slightly larger than a snow goose. It has a gray-brown body with variable black striping on the chest and belly with white undertail coverts. Feet and legs are orange, but the bill is pinkish. The name comes from the white patch that extends from bill to forehead. There is a Greater White-fronted Goose because of its diminutive cousin, the Lesser White-fronted Goose. They are quite similar but separated geographically from North America. The Lesser White-fronted Goose is native to Asia and Europe and is only occasionally seen on Attu Island, Alaska. This goose has one of the largest ranges of any goose. It breeds across the tundra near the Arctic Ocean from Nunavut in Canada’s Northwest Territories counterclockwise around the globe all the way to Greenland. Canadian and Alaskan birds winter in southeast Texas, Louisiana and Mexico and from Vancouver, Washington down through California’s central valley. The only part of our country that isn’t a seasonal home or flyover state for this bird is east of the Mississippi River. One thing I really appreciate about Greater White-fronted Geese is their strong family bonds. Like most geese, they are monogamous and form pair bonds that last for years. Their family bonds last longer though. Juveniles may stay with parents through the following breeding season and familial associations with siblings and parents may last a lifetime. And a lifetime might be a long time. The oldest Greater White-fronted Goose on record was banded in 1975 in Nunavut and the band was recovered in Louisiana in 1998, making it at least 25 and a half years old. Migrants are pouring into Southwest Idaho right now. We saw lots of White-fronted Geese in and around Fort Boise Wildlife Management Area near Parma this past weekend, along with what I am confident amounted to 100,000 snow geese. Can you see Greater White-fronted Geese in Eastern Idaho? While we are just outside identified migration corridors for this species, there have been reported sightings within the past five years. The secret to finding them is to not assume that goose-sized dark-colored birds you see are all Canada Geese. 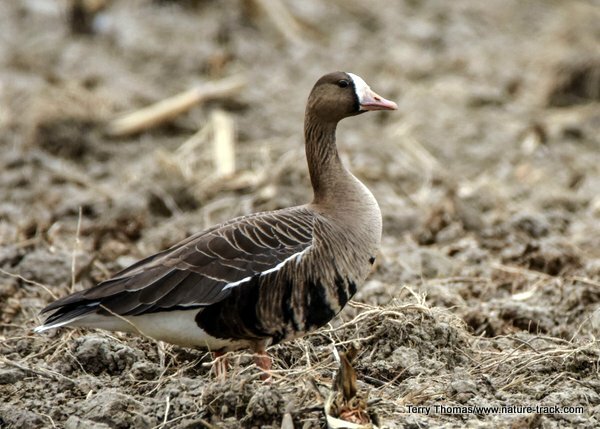 White-fronted Geese like shallow water and also spend a lot of time in the fields just like Canada Geese. Use your binoculars and look for the white face. It is distinctive and hard to confuse with other similar-sized birds. There is more to this sedately handsome goose than a just a white forehead. It deserves a more elegant name more in keeping with its heritage and good looks than its common name implies. Its image would benefit from something more engaging or charismatic. At least a name like the Steadfast Goose would capture its allegiance to family.